Istanbul is one of the most visited cities on the Earth; it’s known for being the only city that spans two continents, Europe to the west and Asia to the east However, the irony is a very minute percentage of visitors take the time to visit the Asian side, and this is a shame, because it’s a wonderful cultural experience (as I experienced on my trip there). Below are five reasons why it’s worth making the short ride across the Bosphorus to the Asian side. Much of Istanbul’s population actually lives on the Asian side, and since so few tourists take the time to venture out, prices reflect what residents pay on a daily basis. High quality clothing such as Turkish wool sweaters are significantly less than on the European side in storefronts and also in outlet malls such as Optimum and Icerenkoy, both of which are adjacent to Metro stations Yenisahra and Kozyatagi, respectively. This also applies to hotels as well, where you can get significantly larger hotels than on the European side for the same or lower price, and restaurants as well. Examples of chains are Hilton Moda, Hilton Kozyatagi, and Marriot Istanbul Asia (where I stayed). Often times, tourists that don’t know any better are sucked into restaurants by hawkers, particularly in Sultanahmet, where the food is mediocre and the price is appalling. On the Asian side, restaurants cater to residents, who demand good food and refuse to pay above a particular price point. Possibly the best known restaurant on the Asian side is Ciya Sofrasi in Kadikoy, where the yogurt kebabs are to die for. Ironically, locals lament that Sofrasi has itself become touristy and pricier as its fame has grown. Always remember, dine where you see lots of locals. That’s a way to know if the food is legitimately good. Kadikoy is the main ferry hub on the Asian side, and it is easily accessible from European ports such as Besiktas, Karakoy, and Eminomu. The ferry ride itself is magnificent, as one can see breathtaking views of the Asian and European side on a short, twenty minute or so journey. Fresh juice and tea is available, and the price of the ride is astonishingly cheap. As stated above, getting to Kadikoy is about a twenty minute ferry ride, and with the newly opened Marmary metro line, it’s not even necessary to take the ferry if speed is the concern. Also, from Kadikoy, there is a new metro line that goes east into Asia, which is fast, modern, clean, and efficient. In my stay, I took this daily from the Kozyatagi stop, which is a few minutes away from the Marriott Istanbul Asia, and rode it for about 15 minutes to Kadikoy, from where I took a ferry into Europe. In the European side of Istanbul, at times it feels as if you aren’t even in a different country, as touts constantly bombard tourists in English and other languages. In the Asian side, you would be hard pressed to hear a single person speak English. It is a bit of a shock, but also the full experience of actually being in Turkey. Also, there are fascinating local markets such as the fish market in Kadikoy, and countless cafes where local sip and talk throughout the day and night. One particular highlight of the Asian side is Bagdat Avenue, which is full of cafes and high end shops. And for tourist sights, there are many historic sights in the neighborhood of Uskudar, which is a more conservative neighborhood, giving another perspective of the city where many people party until dawn. It can be reached via ferry, but now also via metro as well via the marmaray line. All in all, even if only for a day (though a stay in Kadikoy is recommended), it’s worth checking out the Asian side of Istanbul to get an idea of seeing how real residents live their day to day lives, and to eat some great food and get some shopping done along the way. 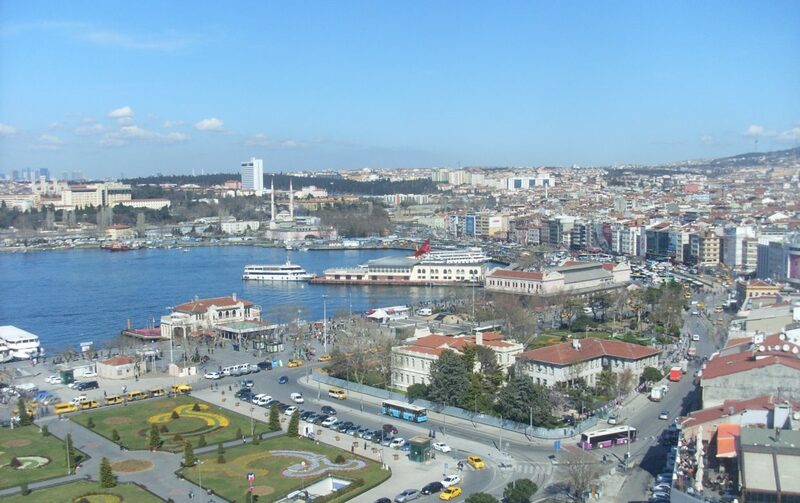 Best of all, you will be one of the few who can say, I went to Istanbul, and spent time in Asia, not just Europe!